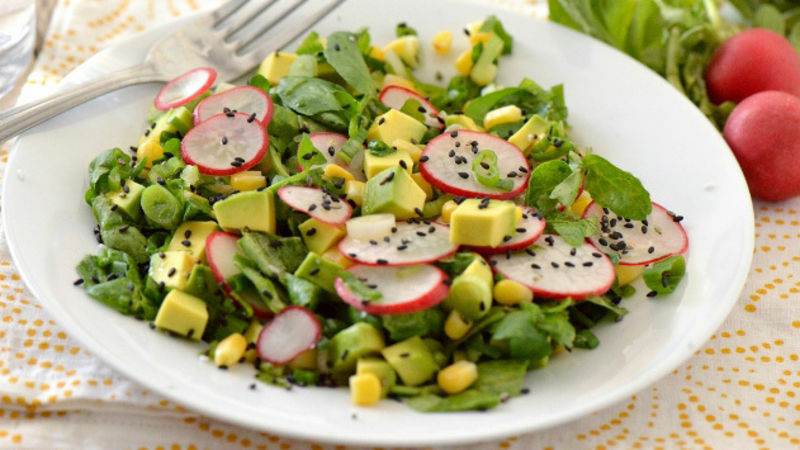 In a large bowl, combine radishes, watercress, avocado, corn, onions lemon juice and rice vinegar. Toss until all ingredients have combined. Top with furikake and serve. If furikake is not available in your area, top with black sesame seeds and 1/4 teaspoon sea salt. Quick and inexpensive salads are my go-to mid week lunch meals. I usually gather all my leftover ingredients from my refrigerator produce drawers and come up with some pretty impressive side salads that pair perfectly with meats and tofu. Take for instance this colorful watercress salad. All it takes are a few strong but flavorful ingredients and a sprinkle of rice vinegar and furikake (a Japanese seasoning comprised of chopped seaweed, black sesame seeds and ground fish). Toss them together quickly and enjoy on a warm spring day.